Press the play button below to listen to the podcast. Don’t see the play button above in your email? Click on the one below to go listen while you hang out at the beach! 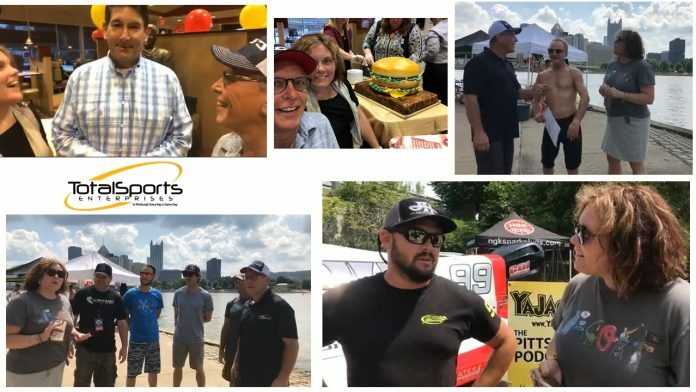 The Ya Jagoff podcast doesn’t want to leave listeners green with envy as we prepare for the Irish Festival THIS September at the Riverplex at Sandcastle. Enjoy custom and tradition at its finest while listening to national & local Irish performers including a visit from international sensations, The Screaming Orphans. Plus eat, drink, shop, dance, and do some Ancient Celtic Axe Throwing as we celebrate all things Irish. Join us September 7th-9th at the Riverplex at Sandcastle as we celebrate the Pittsburgh Irish Festival. Visit pghirishfest.org for details and ticket information. Best part – you don’t have to be Irish to have fun at the Festival! 29:10 Travis and Devon Yates, Power Boat #99: This power duo is a father/step-son team who explain the ages and stages of driving the power boats, the exhilaration of enjoying the craft as a family and enjoying their first time in Pittsburgh…except the roads!